You may have seen the flooding that it happening up north on the news. Flooding can happen to most people in a bad enough storm. It is important to have a plan ready in case of flooding. Or you may suffer from a burst pipe sometime in the future. 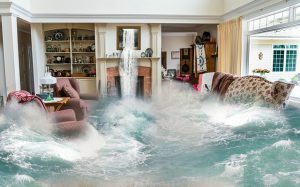 In any event, it is always a good idea to be prepared and know what to do if a large amount of water is entering your home. If you are being flooded by nature, this may not be such an easy task. The forces of water coming from a flood can be too much for humans to stop. In that case, abandon everything and save your life by getting to higher ground. There is no property that is worth your life. But if the flow is coming from a burst pipe you must shut off the water to your house. Usually there is an emergency shutoff in the house. But if there isn’t there is also a shut off on the street. Sometimes you can shut this off with a wrench but you may need to call the city’s emergency help line. It is a good idea to shut off the electricity too in order to remove the risk of being shocked or electrocuted. If the water supply is shut off and the power is turned off, you can now concentrate on rescuing those items dear to you or ones of monetary value. If you live in a flood zone chances are you have flood insurance. Take plenty of pictures of the damage. If you do not live in a flood zone, flooding insurance is sold separately from your homeowner policy and you will want to check your paperwork or call your agent to find out if you are covered. Once you have rescued your valuables and the water source is no longer a threat, it is important to take the right steps to recover. Call professionals to make sure it is done right. You will want to avoid making mistakes during this period to avoid harmful mold down the road. Regarding your plumbing, you may want to consult a professional plumber. They have seen it all. By the time a plumber becomes a professional, he or she has apprenticed for years and has been on hundreds of calls, maybe thousands. The plumber can help you repair or replace the source of the damage and make the problem spot stronger than it ever was. No one is truly ready for a flood or flooding problem when it happens. It is a monumental problem. But the key is to keep a cool head and work the steps mentioned above.